The Bouroullec brothers and nanimarquina, join creative forces once again with Lattice! The Lattice collection springs from the organic imagination of the Bouroullec brothers. The basic pattern, rhythmically reproduced, gives rise to a harmonic succession of colours. Balance, proportion and irregularity are the key elements in the controlled disorder that transforms Lattice into a unique creation. “Rugs are commonly designed as a surface on which a pattern is distributed. However in the case of Lattice, the pattern is defined as a constructive system to generate the form of the rug itself. The system of coloured bands, in which pattern, form and colour are linked in an intimate manner, creates a different scope." - Explain the Bouroullec. With Lattice, Ronan & Erwan Bouroullec continues the path started with the Losanges rug in 2011, experimenting with options of the ancient kilim technique. The collection is handmade in Pakistan with hand-spun Afghan wool. The Lattice collection is available in four sizes and consists of two colour variations: Lattice 1 - navy blue, indigo, moss, and terracotta Lattice 2 - beige, turquoise, and charcoal grey. The collection can be commissioned in different colours and special measurements. 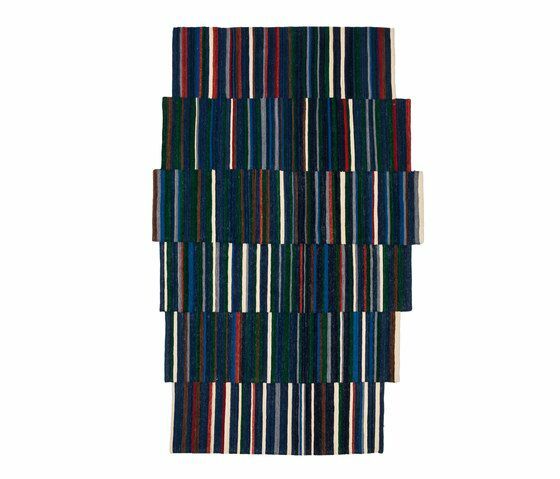 An example of this made-to-measure service is the 5 metre rug we created for the Ronan & Erwan Bouroullec exhibition in Rennes from March 25th to August 28th, 2016.